The interaction of two of the largest hydrological systems, groundwater and seawater, takes place along the coast, either by seawater intrusion to land (SWI) or submarine groundwater discharges (SGD). Groundwater discharge from the coastal aquifers to the oceans takes place when the elevation of the water table of coastal aquifers is higher than the mean sea level, varying seasonally and tidally. SGD provides a route for escape of a large portion of the usable groundwater resource, solutes, and contaminants to sea. The chemical evolution and redox transformation of SGD are poorly understood, especially at the subsurface freshwater discharge zone. Globally, there have been several studies to understand the coastal hydrodynamics of the SGD; however, there is a serious lack of such knowledge from the coastal aquifers of the Indian subcontinent. 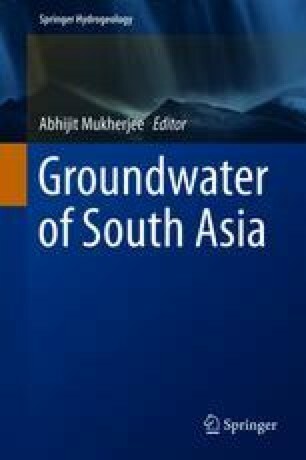 The present chapter demonstrates the details of groundwater discharge to the Bay of Bengal, India (BOB). Our study result shows that SGD can add a huge amount of solutes and nutrients to the BOB, which is likely to have a great impact on BOB ecosystem. Hence, understanding the dynamics of SGD in coastal parts of India is an extremely interesting scientific question along with its societal importance and environmental implications. It is expected that the knowledge and information provided in this chapter would enhance the understanding of the coastal hydrodynamics in site-specific scales and extrapolated, larger scales along the BOB and would be useful in making regional coastal management plan or integrated coastal management plan.